We are thrilled to be featuring for the month of December, Solo Piano Artist Pam Asberry and her 2nd album, “Thankful Heart, Joyful Mind”! Thankful Heart, Joyful Mind, Pam Asberry’s second album to date, is a musical journey through the holiday season. These twelve solo piano arrangements were woven from sacred and secular melodies that span nine centuries and eight countries. 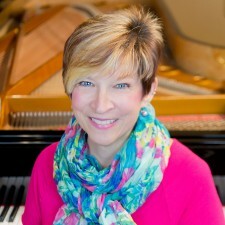 Solo pianist and composer Pam Asberry combines contemporary, new age and classical sounds to create music that is alternately melodic and graceful, dramatic and powerful, peaceful and hypnotic. Her first album of original solo piano music, Seashells in My Pocket, was released in October 2017. Pam received the Best New Artist 2018 award from Enlightened Piano Radio; in addition, Seashells in My Pocket was nominated Album of the Year 2017 at One World Music Radio. Pam’s music can be heard on Whisperings Solo Piano Radio, Enlightened Piano Radio, Spotify, Apple Music and elsewhere. Visit www.pamasberry.com to find out more.